1. The basic information is in this page. You should find what a function is, what rules it has and what domain means, at least. 2. 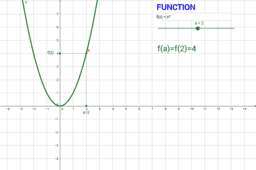 Open this Geogebra applets with a simple example of a function. a) What does f(3) mean? How much is it? How can you calculate that? b) Are there more than one value of a with the same value of f(a)? Is that possible in a function? 3. Now we are going to create something similar. Pay attention and send me the file. 4. Read pages 40 and 41 of this book . 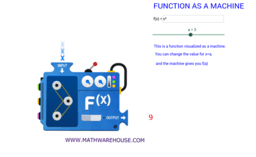 They show you how to calculate the domain of a function. You can find the same exercises with solutions in this link.